I'm sure we're all familiar with the strong reputation of Crest toothpaste. Their products are high quality, effective and affordable. Not to mention, they're always developing new and unique toothpastes that enhance enamel health, whiten teeth, combat sensitivity and more. Well they've continued charging forward in the fight against tooth decay by releasing a slew of new flavors in the Crest Be line. Check out these flavor combos below and what I thought of each! This paste includes the flavors of fresh vanilla and peppermint mixed together! It, of course, tastes great and I like that the long-lasting flavor ends up being the cooling, refreshing peppermint. Spearmint is the primary flavor in this combination but the little hint of lime certainly adds a surprise. 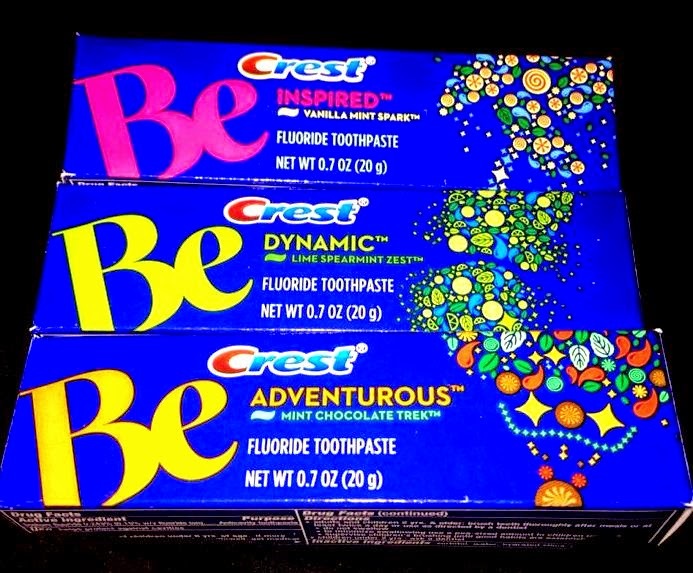 I liked this one but I'd say it's definitely one of the more unique toothpaste flavors that I've ever tried. I know from the dentist's office that Mint Chocolate toothpaste is amazing. And this one did not disappoint! It's delicious and would probably work really well in getting kids to brush their teeth. It's like dessert! All in all, the combinations were amazing and totally unique. I'd have to say that my favorite was Mint Chocolate Trek, followed by Vanilla Mint Spark, and last, but still delicious, is Lime Spearmint Spark. So why not BE bold and try something new! What flavor would you like to try!? *I received these products as part of an advertising campaign through BzzAgent.com. All opinions and views expressed are my own. All photos are my own.